The bases of the calculation of damages in wrongful termination cases are the facts learned and assumptions made by the CPA damages expert. The most important of these facts and assumptions are summarized below. An often-cited source for information on worklife expectancy is the article “The Markov Process Model of Labor Force Activity: Extended Tables of Central Tendency, Shape, Percentile Points, and Bootstrap Standard Errors,” Gary R. Skoog, James E. Ciecka and Kurt V. Krueger, Journal of Forensic Economics 22(2), 2011, pp.165-229. The article includes tables showing worklife expectancies for initially active and initially inactive men and women by level of education. 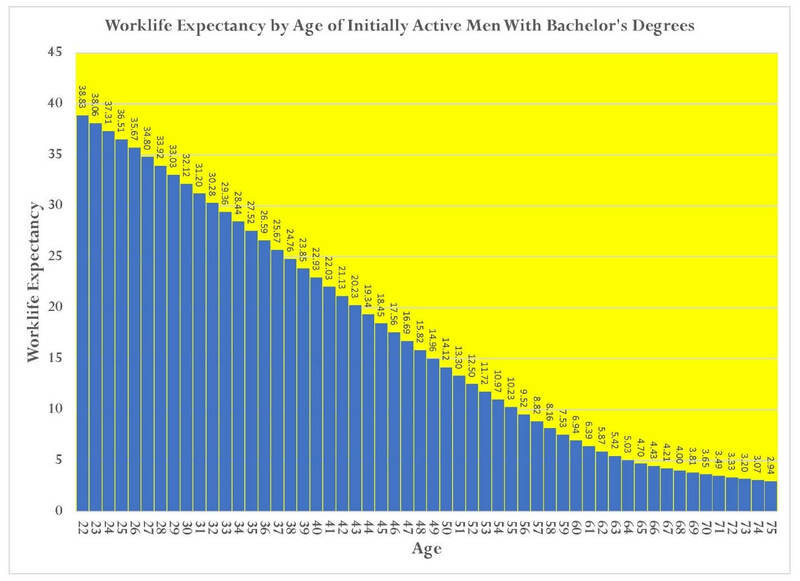 For example, the graph below shows worklife expectancies by age for initially active men with a bachelor’s degree (but not higher). Authoritative information on life expectancy are available from several sources, including National Vital Statistics Reports prepared by the U.S. Department of Health and Human Services, and Actuarial Life Tables prepared by the Social Security Administration. 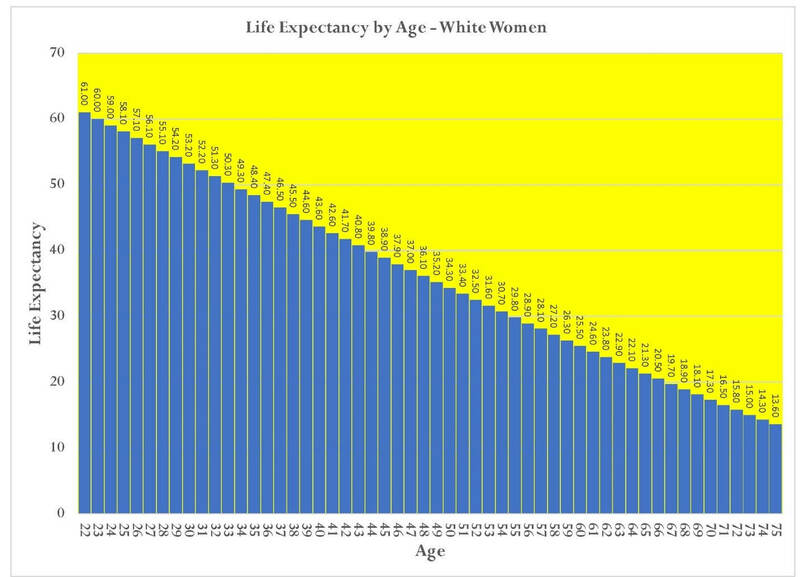 The graph below shows the life expectancy by age for white women. A key challenge in determining damages in wrongful termination damages is to project by what amount plaintiff’s total earnings would have increased (or decreased), both but for and currently expected, given the termination (which is assumed to be wrongful) has occurred. There are many resources that provide information on historical and currently projected earnings in the United States. These include the Census Bureau, Bureau of Labor Statistics, Social Security Administration and the Organization for Economic Cooperation and Development. 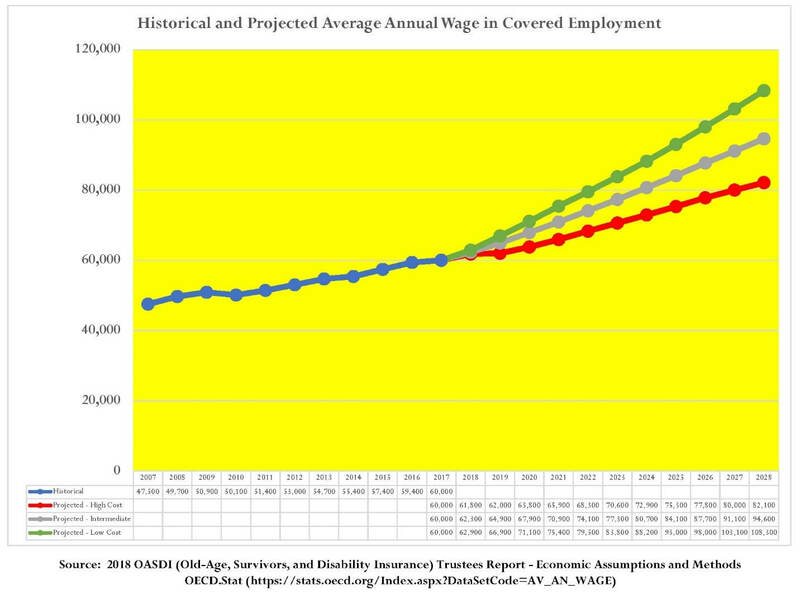 The graph below shows historical and projected future earnings for an individual who earned $60,000 in 2017, based on alternative projections made by the Social Security Administration. Above and beyond wages and salary, fringe benefits can be a significant portion of an employee’s compensation. News releases by the Bureau of Labor Statistics regarding employer costs for employee compensation are an important source for information on the value of these benefits. The table below shows that, for example, average benefits for civilian workers can increase the cost of an employee’s total compensation by 46.6% over the cost of the employee’s wages and/or salary. Projected future earnings in wrongful termination cases can continue many years, particularly with regards to retirement earnings, which often are assumed to continue from plaintiff’s worklife expectancy (i.e., age at retirement) to plaintiff’s life expectancy (age at death). The choice of which discount rate is applied to these projected future earnings can have a material impact on the calculated present value of these earnings. The table below shows the impact of choosing different rates to discount to present value projected future earnings of $50,000 per year beginning five years from today and continuing for an additional 20 years while growing 3% annually. When you are working on a wrongful termination case and need the help of a CPA expert witness to calculate the damages caused by wrongful termination, call the experienced experts at Thomas Neches & Company, LLC. Howard Karlitz v. Viewpoint School, et al. Debbie Dennis-Johnson, M.D. v. Magan Medical Clinic, Inc.
Anthony Kelly v. United Parcel Service, Inc., et al. Sunny Chow v. Applied Micro Circuits Corporation, et al.